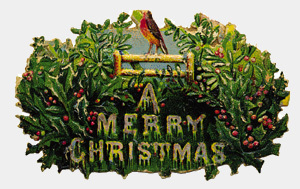 Enjoy hundreds of free classic old time radio Christmas shows year round! Hanging stockings, tinsel, hanging ornaments, family, friends, and listening to favorite Christmas carols and songs all make for great memories. 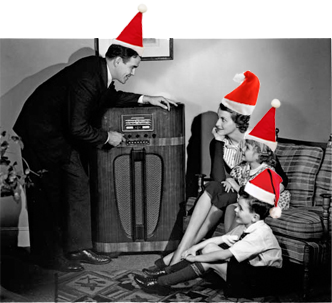 In the 1920s, 30s, 40s, and 50s families gathered around the radio to listen to the long-awaited Christmas editions of their favorite shows, making for great memories. Most old time radio shows produced some sort of show for the Christmas, even shows that you think wouldn't lend themselves to a Christmas show like Dragnet, Suspense or The Whistler. Seriously, what could be better than Sgt. Joe Friday at Christmas? Don't forget perennial favorites like A Christmas Carol. As a matter of fact, there are several versions of Charles Dicken's beloved story of ghosts and happy endings. Several radio serials performed their own version of the story.Imagine A Blondie Christmas Carol or A Richard Diamond Christmas Carol.Those must be interesting! Think, too, of all the happy Christmas music played by those famous orchestras like Guy Lombardo and Glenn Miller plus shows by singers like Bing Crosby or Dinah Shore.The kiddies weren't left out with shows like Cinnamon Bear with an episode six days a week between Thanksgiving and Christmas. Explore the Old Time Radio Christmas site and listen to samples of radio shows in each genre; music, detective, suspense and more. Enjoy a Merry Christmas any time of the year and stop by and listen to a new Christmas episode every day!